Three Cheers For Coup Democracy - This Can't Be Happening! It was a typical US government response to favorable facts-on-the-ground rooted in violence. Once the military coup in Egypt had been accomplished and the first democratically-elected president of Egypt and many of his allies had been arrested and all sympathetic radio stations had been shut down, the US State Department released a statement expressing US condemnation of any future violence. While the dirty deal was going down President Obama played golf and Secretary of State John Kerry went sailing off Nantucket. It was a bit like the The Godfather when Don Corleone is shown in church and the sequence is inter-cut with scenes of men being shot dead in bed and sputtering as they are being garroted. This is not a particularly novel turn of events — just especially dishonest and dishonorable. It seems to be the way the US does coups in the 21st century. The days of crude coups like Iran (’53), Guatemala (’54) and Chile (’73) are long gone. Today, it’s done with great coordinated finesse thanks to a sophisticated international secrecy network vis-à-vis American taxpayers and the rest of the civilian world. As citizens, all we get is public relations that expresses great concern for the control of violence … once the favorable facts-on-the-ground have been established. Currently, members of the Freedom and Justice Party, the name of the Muslim Brotherhood’s and ousted President Morsi’s political party, are furious. They should be. The New York Times reports that the party is planning to organize escalated demonstrations across Egypt. Many fear where this coup will lead. A 23-year-old female law student told The Times that her Islamist neighbors had started shaving their heads, which sounded ominous. “Everyone’s worried about a civil war,” she said. The body count is now rising. Back in 2009, the Obama administration sent out the same sort of boilerplate garbage statement about stability and condemning violence when the democratically-elected, left-leaning president of Honduras, Manuel Zelaya, was awoken at dawn by a gun to his head and flown out of the country in his pajamas. The same earnest US statement condemned future violence, defended democracy and expressed concern about stability. The dirt-poor, basket-case nation then devolved from its already lowly state into the homicide capital of the western hemisphere. And, in what is surely the most significant post-coup fact-on-the-ground, since Zelaya was ousted, a host of US military bases have sprouted like mushrooms out of the more fertile soil. It’s true that the United States has lost a lot of its imperial mojo of late in the Middle East, but the important thing is it has not lost that mojo vis-à-vis the incredibly corrupt institution of the Egyptian military. Years of US tax-payer largesse has helped feather the nests of corrupt Egyptian officers in a military that’s deeply invested in business and finance. Washington’s excellent public relations skills help in these 21st Century coups by working the Sunday news talk-show circuit and other venues of meaning to get the right story out. Elliot Abrams of Iran-Contra fame was one of them cranked up for the Egyptian coup. What’s important is that the American people be re-assured that stability is the most important thing and that the White House condemns any future violence. Everything is OK. It was not a coup. 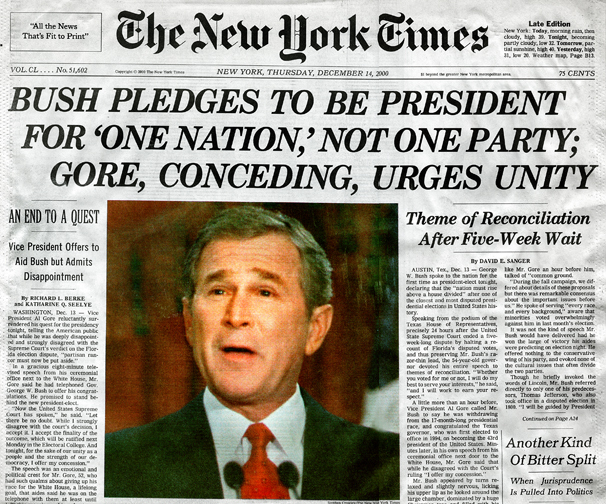 The same sort of stability-focused public relations occurred in the notorious 2000 US presidential election. I know we’re not supposed to talk about that episode in American democratic history any more, since Al Gore patriotically ate the roadkill raw for the sake of stability and in the name of discouraging anger and maybe violence. It also turned out to be good for his future as a middle-brow environmental hero and money-maker. As you may recall, the declared winner of that absurd episode, George W. Bush, assured voters that he was going to rule for all Americans. Better than anyone, he knew he’d lost the popular vote by 500,000 souls and would have lost the Electoral College if there had been a fair vote in the state ruled by his brother. So he too sucked it up and said what he had to say. Then, of course, he got behind the wheel and drove the nation into a ditch off the right side of the road. He mounted a completely unnecessary war that wasted trillions of dollars and cost the lives of thousands of US service men and women. Then, he exploited the disastrous program of his Democratic predecessor to provide every American a house and nurtured an unaccountable Wall Street greed machine that hauled the battered car out of the Iraq ditch and, by 2008, sent it careening over a cliff. This record makes Mohamed Morsi’s year-long run look like child’s play. Consider it a modest proposal in retrospect. But think what might have been if we had been able to use the Egyptian military model of democracy. Think how comforting it would have been to have the Joint Chiefs step up and declare they were ready to throw the unduly-elected George W. Bush and his far-right cronies out of office in the name of “the people.” The Generals might have appointed an esteemed character like George Mitchell to be interim president until a truly fair election could be arranged. The Supreme Court could have used the same sophistry they used in Bush v. Gore to make it at least sound legal. Sure, it would have been a mess. But it could not have been a worse mess than the one that was the illegitimate reign of George W. Bush. The republic would have survived. In fact it might have been a worthwhile reality check. And we’d all now be much better off. But, of course, I must be smoking something. This is not how things work. The analogy is completely wrong; it’s silly to imagine the US military would do something like that. Our joint chiefs were delighted by the far-right swerve George W. Bush had taken; it boosted their powers like never before. It didn’t matter one iota that he’d stolen the election. If George W. Bush had been a Muslim, of course, it would be different. It’s tragically logical that if the first democratically-elected president can be so easily removed by the military and the dirty deed so neatly finessed by Washington, the future of real democracy in Egypt seems doomed. We’ll have to wait to find out what the cost of such a devil’s bargain will be for ordinary Egyptians. A US-excused coup was disastrous for Hondurans. It’s clear the Egyptian coup benefited militarists in the United States and Israeli governments. Ironically, it apparently also benefited President Bashar al-Assad in Syria, who said he was delighted by the coup that removed one of his more worrisome opponents. The question for Americans — at least for those still awake — remains how do we put a check on our own massively corrupt military institution? And how do we create real democracy and save the mess we have from the vise grip of militarism and rapacious, unaccountable wealth?